My mother-in-law is often my source for new reads and most recently she gave me one I could not put down. The Glass Castle is a memoir that reads like fiction. The author, Jeannette Walls, opens the book with a story recounting her in a taxi, driving down Park Ave. in New York City, glancing out the window to see her mother digging through a dumpster. 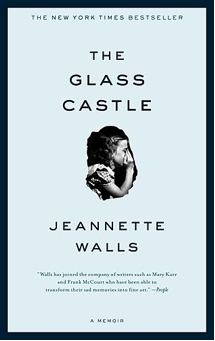 When the scene closes as she slinks into her seat, we are taken back to her childhood, growing up in a nomadic family running from the law, debtors, with a patriarch who keeps chasing his pie in the sky, the glass castle. The book is shocking-as I said it reads like fiction. Though there is no doubt love in the home and family, yet the kids act as caretakers beginning at the age most are learning to tie their shoes and read, while living in unnecessary poverty. For example, Walls was boiling her own sausages at age three. The father is a gifted engineer, foiled by his alcoholism and gambling. The mother, an artist at heart that repels social norms, finds her muse in sleeping and laying on the couch all day while the kids scrounge for food in bins after school, or distract themselves with homework during lunch hour. Food was considered edible even if vermin had already claimed it. Walls narrative of her life's story is poignant and tests the reader in how to view the family-do you sympathize or empathize? Neither her or her siblings call upon help when frustrations mount to a level where child protective services takes them away, following bouts of rage from their alcoholic father or incapable mother. Remarkably, the children display the American attitude of picking themselves up by their bootstraps and carrying on. This book is a page turner and on the New York Times Bestseller List for good reason-because I highly recommend it. i loved this book too! I also enjoyed her next one, about her grandmother. fascinating. Half Broke Horses..something like that.